LOS ANGELES (AP)—Florent Serra defeated Fernando Verdasco and Denis Gremelmayr beat Feliciano Lopez on an afternoon of upsets Wednesday at the Countrywide Classic. Serra ousted the second-seeded Verdasco, hampered by a sore ankle, 6-2, 7-6 (4). Gremelmayr took a 7-5, 7-5 victory over No. 4 seed Lopez. In a night match, No. 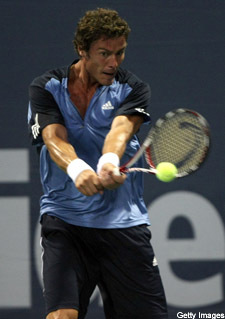 5 seed Marat Safin advanced with a 6-3, 6-2 victory over Wayne Odesnik. Top seed Andy Roddick opens play on Thursday night against Dusan Vemic after Donald Young, a 19-year-old who upset defending champion Tommy Haas in the first round, faces Marc Gicquel in an afternoon match. “It was a tough match. It’s a very good win for me,” said Gremelmayr, a German ranked 89th.